Fall wedding invitations and favours/favors with beautifully illustrated autumn leaves. Perfect for anniversaries and engagements. ​autumn love and engagement parties. A concise and versatile set for autumn occasions – invitations, favors, table graphics and decorations. ​A bonus insert is included. 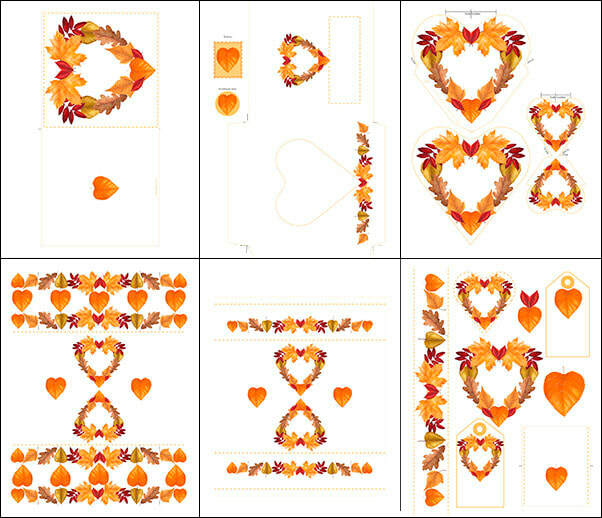 The designs with a border and heart of fall leaves for fall wedding invitations and favors, is also ideal for golden anniversary stationery, as well as for autumn love and engagement parties. Also see the square layer card and envelope set for general crafts with an Autumn Leaf theme. CLICK HERE TO MAKE SUGGESTIONS FOR FURTHER ITEMS IN THIS RANGE! • A page of cardstock items for a serviette ring/border, tags, placecard/table number, stickers and heart motif that can also be a serviette ring or decoration on other favors made with color cardstock. • A choc wrapper that can be cut for a Hershey bar or 100g European bar. • Two heart packet sizes for favors. ​The large one takes a Lindt Coeur Fin chocolate heart. The small one can be used for a small mint, choc or lollipop. ​They can also be used as gift packets for charms, rings, earings etc. NOT need a Paypal account to buy. This is a digital download product. Connect with Anni Arts Crafts! Please Comment and Make Suggestions. Tick suggestions below to add to this set, or comment on the comments page. Do you like this range? Should I add more items? If so what?